Masonry brick is distinguished and timeless. The color and texture creates a traditional, historical appearance that cannot be matched with any other building material. Real Thin Brick makes it possible for you to bring the traditional look of standard brick floor, to the interior or exterior of any home or commercial space with installation ease. Real Thin Brick products are brick tiles that are manufactured specifically for flooring, but can also be used on walls or anywhere your creativity allows. Our hand-made brick tiles are four times stronger than the ANSI standard for floor tiles. Because of their lighter weight and standard half inch thickness, our brick tiles can be used in places that can't support the weight or bulk of standard brick. Since all of our brick veneer products are hand-made to order, we can help you achieve any design. Select a style you like from our two collections (Antique or Rustic), your preferred color variance, and finishing touches. Each brick is kiln-fired at 2200˚F, rendering a highly durable, vitrified product that is guaranteed to last a lifetime wherever it’s installed. Real Thin Brick tiles can be used in any structure, old or new, inside or out, offering flexibility and durability that rivals that of any other building material. Our thin brick tiles can be used anywhere standard ceramic tile is used, and once sealed are water and soil resistant. Best of all, we will work with you to create custom brick flooring, brick wall coverings, or brick pavers, exactly to your specifications. Every brick veneer we manufacture is made to order, which means you can get the look you want for just about any application. We use many molds for every style of brick tile we manufacture. This ensures that irregular qualities of real brick are mimicked perfectly when you install your brick tiles. In traditional masonry, minor misalignments subtly suggest the hand-made artistry unique to brick. Our custom process allows you to maintain this random appearance, even when working in larger areas as with brick flooring. Another way we control the color of our bricks during the manufacturing phase is through the use of natural clay powders that act very similar to a glaze. We sprinkle these powders on each thin brick by hand, further differentiating the appearance of every tile. Further color variation is achieved depending on how close each brick rests to the flame within the kiln when being fired. If you prefer a smooth brick surface, our Elegant Collection would be a good place to start your search. If you like a more worn look, our Rustic Collection offers the texture you're looking for. These design and manufacturing practices makes it possible for you to choose a specific look for your bricks and have them made to order. You can choose a brick size, pick out a color, refine the tone and texture of each brick, and then lay them out in whatever installation pattern and technique that best suits your space. One of the biggest advantages to using our thin brick tiles is their lightweight structure compared to traditional brick. On average, each one of our tiles weigh between 7-12 oz as opposed to 4-5 lbs for one standard brick. Full sized bricks aren't practical for many applications, but brick tiles can be used over just about any surface, even on walls that aren't strong enough to support heavy brick. Most brick veneer manufacturers cut full sized bricks to 1/2 inch thickness, which causes their products to become more fragile and brittle. This is especially problematic for brick flooring, which must be able to withstand the rigors of daily use. When it comes to selecting your grout color and type, it's important to consider where the brick tiles will be installed and what kind of traffic they will receive. Some grouts have antimicrobial agents that help prevent mold and mildew, and epoxy grouts should be considered when installing tiles in areas frequently exposed to water, like a bathroom or kitchen. We don't endorse any one method of DIY brick veneer installation, each may have advantages and disadvantages depending on the application. No matter which method of brick installation you choose, we recommend working in small sections. For brick flooring, fill grout spaces full and use a damp sponge to pack the grout firmly into the spaces. If a little gets on your brick surface, you don't have to worry because it will add to the imperfect beauty of the overall installation. It can also be cleaned up before sealing the grout, if that is your preference. We highly recommend sealing our tile before grouting to protect from staining. If the surface area is frequently going to be exposed to water, we recommend sealing the surface of your brick tiles overnight. You should also seal the grout once it has set. This will make cleaning your brick far easier, and also prevent mold and mildew. Any member of our team can help guide you to various professional sources of information that you will undoubtedly find useful if you're going to conduct your own DIY installation. For brick flooring that's being installed over an existing wood floor, we recommend the installation of a 1/4" backer board. If you are installing your brick flooring over cement, install the brick pavers directly on the floor. Apply tile using a thin set mortar with a tiling trowel to set each paver in place. 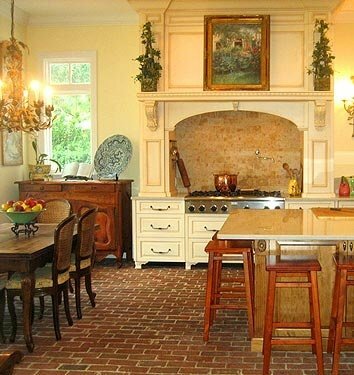 Brick flooring made from our products will last a lifetime. However it is important to make sure our tiles are sealed and maintained properly to ensure ongoing durability and lasting appearance. Make sure to use ceramic or stone sealing products- these are also suitable for brick and brick flooring. For the day-to-day cleaning of your brick flooring, sweep, dry mop, or vacuum the entire surface to remove any dirt or debris. Next, use a 1 to 15 part vinegar/water solution to mop your brick flooring, ensuring that you use a microfiber mop that is wrung out completely after being dipped in the solution. For regular deep cleaning of your brick flooring, remove all debris, and then use a deep-cleaning solution of your own preference and follow the manufacturer's specifications. Make sure to use gloves, a mask, and ensure the room is well ventilated whenever using deep-cleaning chemicals on your brick flooring. With proper care, our brick flooring products will maintain their look with a lifespan equal to that of whole brick. Why choose Real Thin Brick tiles? There are other products on the market advertised as "thin brick," but our products stand out for a variety of reasons. Unlike other manufacturers that cut full-sized bricks to half inch thickness, which makes them brittle and prone to fracture. At Real Thin Brick, we manufacture our brick tiles at half inch thicknes. This ensures high durability and strenght. Are you ready to turn an ordinary space into something truly spectacular? Once your brick veneers are installed, they will look like they've been there forever, instantly adding warmth and elegance to any area. From an exposed brick wall to magnificent brick flooring, you can have it all. We happily work with contractors, interior designers, and DIY homeowners who understand the value of quality. If you have a specific request, we are eager to accommodate your particular needs. Contact us today for a free sample of our thin brick tiles, get a fast and free price quote, or if you have any other questions.